IS TRUMP FEAR MONGERING ABOUT THE BORDER? | GeeeZ …. IS TRUMP FEAR MONGERING ABOUT THE BORDER? READERS; WHAT DO YOU THINK OF THIS? I FOUND HER STUPID AND FAR MORE CARING TOWARD ILLEGALS THAN AMERICANS. 25 Responses to IS TRUMP FEAR MONGERING ABOUT THE BORDER? It’s like a mantra with them, a compulsion, like druggies whose intellects well know the dangers of meth or opioids or alcohol, but whose limbics demand that next fix, that next high, that next escape into the alternate universe of faux bliss, of chemical euphoria, of momentary fantasy. Most are not stupid, not ignorant, not even uninformed . . . they understand the dangers of unrestricted immigration – the crime, the disease, the tax burden. But their common sense is trumped by the allure of no Trump and their brains switch to auto-hate when faced by a policy they previously endorsed but now must repel because of its proponent. None is so blind as he who CAN but WILL NOT see. To paraphrase Golda Meir, there will be progress when radical leftists learn to love their country more than they hate Trump. Damn. I sick to death of those open-borders morons. The National government, not the state of New Mexico, is responsible for border security. I would activate all those New Mexico guardsmen. She is a democrat tool. Period. Isn’t it crazy? There is NO PROBLEM? Where has she BEEN? I stuck the AOC thing on my blog. Off the Richter Moron scale. ALL THIS NONSENSE STOPS WHEN A WALL IS IN PLACE. Y’know . . . like everyone else, I pick on rookie Congresswoman Alexandria Ocasio-Cortez, or Lexi Occasionally-Confused, or Ally Allee-outs-in-free-o, or even Alexa Occluded-Kotex . . . whatever . . . the “future” of the Democrat party and the darling of the loony left. But I also have pointed out the great difference between irretrievably stupid and monumentally ignorant, and I think she’s the latter. Her brain seems to function quickly and logically when challenged, but she’s like a big naval gun which uses pixie dust for powder and shoots stale marshmallows made with NutraSweet. First one shows her in jeans and a work shirt, holding potting soil with a dollar bill stuck into it as if planting bills to grow money. The other shows her holding a placard with a pot of gold at the end of a rainbow with the caption “Just a few more Pride Parades and we can fund “Medicare For All”! The history of Texas, New Mexico, and Arizona demonstrates that there have always been individuals who support La Raza and Hispanidad movements, though which formerly Spanish subjects of the Americas seek to raise themselves to a level of respectability apart from the mainstream societies of the United States and Mexico. While not referred to this, as such, it existed in these locations (and California) as part of the resistance to Anglo-settlements. One might recall the 1972 Clint Eastwood film Joe Kidd. Same theme. The issue is acute along the border with Mexico and has always been so. In the early 19th Century, Mexico’s army invaded Texas on several occasions; in the early 20th Century, Mexican insurrectionists conspired to murder all white men over the age of 16-years as an off-shoot of the Mexican Revolution. Since then, confused Americans (those who feel compelled to hyphenate their nationalities, subordinating one to the other) have turned to state-based political action to achieve these same ends: returning vast territories in the Southwestern US to Mexican control. It is only this: stupid. As to New Mexico, the people reveal themselves by who they elect to statewide offices. Once again, though, it makes sense for Democrats to open borders; doing so will guarantee Hispanic politicians a good income for the next 200 years. I offer two centuries only because I don’t think a Hispanic-controlled society could last beyond that. What, now she’s questioning all the border security officers that have been interviewed saying it definitely is needed and will be a tremendous help? Her first name Lujan I believe is a Hispanic name and that she is married to a non-Hispanic (Grisham). End of question. Hispanic sympathizer. Besides, like FJ said, the responsibility of secure borders falls under National Security, not the state. Get it done, Donald! All this so-called stolen Mexican territory was conquered by the Spanish hundreds of years ago. If you want to feel sorry for anyone, feel it for the so-called Native Americans. However, there are no original Americans. Remember those ancient migrations of people coming across the land bridge across the Bering Straight? This tells us that the original inhabitants in North America (and South America) were just migrant workers from Asia. To make matters even more complicated, each additional wave of Asians into the Western Hemisphere had conflicts with the incumbent tribes resulting in wars and possibly genocides. This brings up the fact that there is no ethnic group, race, or nationality today that can claim to be original inhabitants of North America. Everybody’s ancestors had a hand in running others off this bountiful continent. Which brings me back to Mexico. There is nothing holy, legal, or even moral that gives Mexico or Mexicans any claim to any territory that is now a part of the United States. The Mexicans took it from the Indians, and we took it from the Mexicans. The Indians took it from other Indians, and have no business claiming an entire continent as their ancestral hunting ground. I will respond at home…Am subbing now…but want to quickly point out Mal’s point …CAN’T SHE SEE THE MARAUDERS? ?DOESN’T SHE HEAR THE EXPERTS WHO ARE WORKING THEBORDER AND SAY THEY NEED MILITARY? The military are there to keep us safe..I rather they be on our borders than those of Afghanistan. Sorry Z. I need to answer your question, “IS TRUMP FEAR MONGERING ABOUT THE BORDER?”. Probably, a little. That’s part of moving the argument. Like, I can say that tens of thousands of foreigners are assaulting our southern border, but you can correct me to say, “Oh, that’s only twelve thousand people”. I may have exaggerated but you just made my point. If the Democrats play Trump’s game, he wins. The Dems are trying to replace Trump’s arguments with their own meme. The population of New Mexico as of 2010 was 47% Hispanic descent. The Governor probably has a lot of support because very high numbers of New Mexicans have kin in Mexico. That’s how she gets away with her rants. You talk to the ‘immigrant’ community and “see fear in their heart.” [Wouldn’t that likely be those who are here illegally?] “I’ve seen no data that shows it [turning criminals over to ICE for deportation] decreases crime. Sure, we have the problem with robberies, homicides, rapes and all of this….” ICE can still remove those people (after the fact!!!). Z, She knows exactly what goes on. Problem is, they need these people in to vote dem. And believe me, they could not care less how much gross abuse American citizens have to endure. They couldn’t care less. THE DEMOCRATS NEED VOTERS. Pure and simple. I agree with all of your input here and appreciate it so much. LOOOOOOOOOOOOOOOOOOOOOOOOOOOOOONG way to go n fixing education. I don’t think it will happen. Kid, no way can we fix education fast enough to have our America back again. No way.You can’t kill off lib professors who have no problem indoctrinating…they’re here to stay. I started the conversation with “What politician would Thoreau have been today?” most of them said “BERNIE SANDERS” immediately…I could have kissed them….because the guy was all about ridiculous liberal , condescending, ridiculous arrogance “Only great poets can read great poets!” I asked “Hey, any GREAT POETS at our school? Yet you all read great poets, right?” Shot holes in a lot of his silly ‘The wealthy are wicked’ crap! And the kids totally bought what I said! One girl said he’d be an Indie or Libertarian. I was SO proud of the conversation from these kids! Having said that; these kids are rare…………our schools are LOST. If you talk to people living on the Southern border you will get a resounding Build a Barrier. The politicians don’t really care about what people want because it is not good press. Ask someone in New York or Boston about securing the border and they think it is not necessary because they are not affected. Go ask those who live there. Z, I agree. The only thing I can think of that offers the slightest hope is this 10,000 foot view which is based on investing but can be applied to anything. kID, YOU HAVE TO LAUGH!! I don’t have my reading glasses on and was squinting at your chart, doing pretty well, till I hit Anxiety…then DENIAL…which I read as DENTAL…!! “DENTAL? !” HA!! 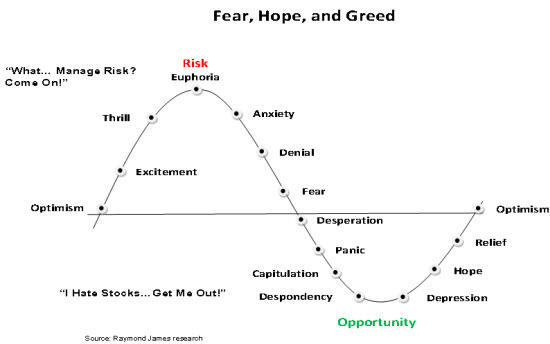 But, yes….this does work… So what will be our OPPORTUNITY\ MOMENT which kicks us back up to OPTIMISM? A Bible study teacher I knew and ADORED, used to say “You have to hit rock bottom first so you’ve got that rock to push up against in order to go up!” She’s right and this chart echoes it, doesn’t it? Z, that’s my feeling. The kids are going to have to feel the pain of rock bottom bad decision making before the freighter turns around. Will it be too late?